Painting a target over your heart makes you -- wait for it -- a target! And while Frank Miller's Dark Knight can get away with claiming the heavy Kevlar vest he wears is the reason for his bright yellow insignia (draw fire to the most protected area), you and I both know most modern super-heroes couldn't hide a sheet of paper beneath the skin-tight spandex of their costumes, much less body armor. 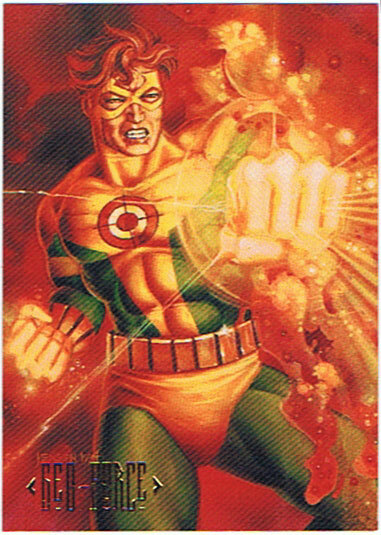 Looking specifically at Geo-Force's costume here, I have to worry particularly about the red line pointing down from the target insignia, as if to say "Hey, if my heart isn't a tempting enough target for your super ray beams of death, take a look at this fantastic alternative!"